but we're all dancing to it nevertheless. to every tunes of the symphony celestial. It is reported that Ja'far Al-Sādeq has stated that, saying Al-Hamdulillāh is praising Hu (IT) by ITs Divine Qualities as Hu has praised Hu (ITself); for the root word Hā-Mim-Dāl contains: Hā as in Wahdāniat (Divine Oneness), Mim as in Mulk (Sovereignty, Power to prevail) and Dāl as in Daymoomyat (Everlasting Duration). So that whoever recognizes Hu (IT) with Wahdāniat, Mulk and Daymoomyat has recognized Hu (IT) truly. 1. When Allah gives you, you recognize that Hu (IT) has given. 2. That you are satisfied with what Hu (IT) has given. 3. That as long as you have strength in your body you will not disobey Hu (IT). Thus the meaning of "Praised be the Sustainer (Rabb) of the Worlds" is that Allah states: " start praising Myself before any creature of the Worlds praises Me". My Praise to Myself occurred in the Azal (Sempiternity) without causation, while My Praise of the Created is tinted with/related to causation. It has also been said: that since Allah knew that Hus (ITs) worshipers would not be able to Praise Hu (IT) as Hu deserves to be praised, Hu Praised Hu (ITself) with Hu (ITself) in Azal (Sempiternity) as expressed by the Chieftain of Messengers in his saying: "I am unable (through the limitation of my humanity) to praise You"
It has also been said that Hu praised Hu (ITself) in Azal (Sempiternity) as Hu Knew of the bounty of Hus (ITs) Gifts to ITs worshipers and their inability to Praise Hu as Hu deserves to be praised. Hu then praised Hu (ITself) on their behalf so that they can more completely enjoy Hus (ITs) Bounty as Hu has taken away from them the burden of being under obligation to Hu (IT). If we were to be asked as to the reason for the presence of the letters Alif & Lām in Al-Hamd (AL being article 'the') and why the word does not just come without AL as in "Hamdan lillāhi rabbil ālameen"? We would relate that it has been said that the presence of the letters AL serves a meaning that is not served by the word Hamd without them. Their presence indicates that all praises and complete gratitude are due to Allah. If AL were to be left out, it would not be clear that the praise is addressed to Allah and to no other. 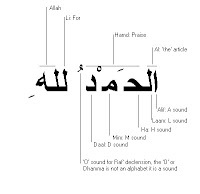 For the meaning gathered from "Hamdan lillāh or Hamdun lillāh" is "I give Allah some praise" which is not the interpretation of "Al-Hamdu lillāhi rabbi ālameen"- the mother of the Qur'an- which when properly interpreted reveals that All Praise is given to Allah for Hus (ITs) Uluhia (Divinity), ITs bounty to ITs Creation on whom Hu (IT) has bestowed unequaled gifts in the Din (Religion), Duniā (World), near future and the Hereafter. Hu (IT) is then the Giver of Praise (Al-Hamed) and the Receiver of Praise (Al-Mahmood) and all and everything reflects Hus (ITs) State of Glory and all are watered from the same source. Our Imam Maturidi stated that, Allah has praised Hu (ITself) to teach Creation (how to do so), and no harm in that as Hu (IT) is the Deserving of Praise because of Hus (ITs) Dhāt (Divine Essence) as no failing or imperfection can affect Hu (IT). Allah’s saying: All praise due to the Lord of the universes, is Allah’s offering of Divine Gratitude to Hu (ITself) on behalf of the slaves since Hu (IT) knows that they are unable to offer such gratitude by themselves. Also this antecedent praising establishes an Adab (Etiquette) as a grateful obligation for them to praise Hu (IT). How could I ever offer my true gratitude? - Credit: Untired with Loving | From an exegesis of Hamd or Praise of Opening Sign of the Last Testament (Surah al-Fatiha) | Translation from classic texts by Dara O. Shayda, Hind Rifai M.D.